From sailing across sparkling waters to visiting quaint inland villages, Croatia offers a patchwork of ancient histories. Roman ruins, Habsburg villas, medieval fortresses and red-roofed villages are weaved together in the landscape, making this corner of Europe a photographer's delight. In this inspirational and hands-on workshop, we will enjoy 7 days and 8 nights exploring Croatia's Dalmatian Coast, from its charming islands to its national parks to its UNESCO World Heritage sites. Every day and evening will be filled with photographic opportunities, but the variety doesn't end with the locations! Photography legends Alan Ross and Dan Burkholder join forces for the first time ever, to offer a full spectrum of photographic expertise. From film to phone, no photographic interest is left behind. ​Alan Ross is an internationally respected master photographer and educator who worked side-by-side with Ansel Adams as his photographic assistant. As an educator, Alan specializes in helping photographers at all skill levels. Whatever your style or format—color or black-and-white, film or digital, large format or 35 mm—Alan is dedicated to helping you merge vision, passion and craft. Dan Burkholder, master photographer, artist and photographic innovator, promotes a lightweight approach to image making where you can shoot with any digital camera that allows you to transfer images to iPhones and iPads. You’ll discover the joy of editing on your iPhone during lunch or on your iPad in the middle of the night — a dream for the travel photographer! Alan and Dan will be at your side providing photographic know-how, experience and a light-hearted approach to sharing friendship and making memories during this photographic adventure. Photographer Jill Skupin Burkholder will be along to assist with the photography. ​Partners and spouses are welcome on the trip (an additional supplemental cost) but they will not be able to attend the workshop sessions and shooting opportunities. Julie Ross, Alan's wife, will be organizing a host of fun activities and outings for this group. The final supplemental price will be based on the group's interests and how many partners/spouses are on the trip. This supplemental cost is expected to be between $750-900 and includes breakfast, dinners and some lunches and several sightseeing adventures. The workshop group will gather on Sunday evening, May 20th, for a get acquainted dinner at our beautiful villa hotel in charming Stobreč, 10 km from Split (Villa Ark Apartments). 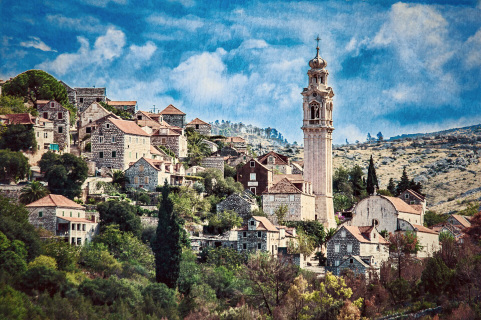 Beginning Monday, we will venture out on day trips to surrounding areas, including Diocletian's Palace, Trogir, the Klis Fortress, Krka National Park and others. The itinerary is subject to change but will always be planned for the best photographic opportunities! There will be excursions by ferry to nearby islands and the workshop will end on the island of Hvar, where you can continue your Croatian travels by either going south to Dubrovnik or north back to Split. The group is limited to 10-12 participants. The workshop price is $4800. On the unlikely chance that we need to cancel the workshop for any reason, you will be refunded the entire workshop price. Rooms are based on single occupancy and all have private baths. Partners/spouses can stay in a double room which is included in the Supplemental Fee. Let us know early if you have difficulty with stairs. Send your deposit to hold a spot or write for more info. 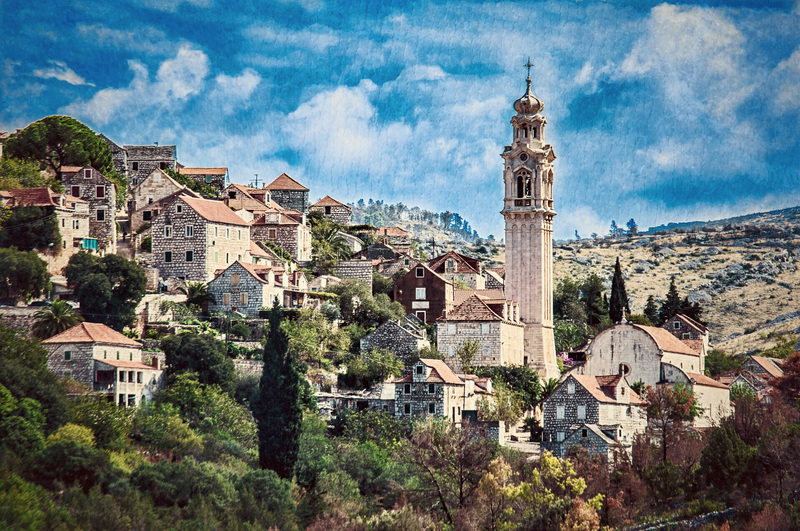 An 7 day/8 night photo excursion on and off the coast of Croatia. Your deposit will reserve your place in this 2018 photographic workshop. The full cost of the trip is $4800. ​Any camera is welcome — from Large Format to DSLR to Mirrorless to iPhone. For anyone working in film, please bring portable processing tanks so that we can process film and then review images by reading negatives as a positive image using the iPad and iPhone. iPhones and iPads should be newer models that have the smaller Lightning connectors (not the wider, 30-pin charging cables from days of old) because these models make it much easier for us to share images during classroom critiques and lessons. A month before departure, you will receive additional detailed information to help you prepare for your adventure. From camera gear advice to packing suggestions, you’ll get lots of guidance to ensure your trip is one of learning and image making instead of problems and hassles. Please send more info about the 2018 Croatia trip with Alan and Dan.